The Model 575 and 575P indicate level by continuously measuring hydrostatic level pressure via its sensing element and transmitted by a 4-20 mA signal. This design provides excellent linearity and repeatability, low hysteresis and long term stability. Both models are easy to install, simply lower the transmitter into the tank, well, or vessel. The 575 has a measuring range of up to 690 feet, but can go in much deeper wells if needed, with thousands of feet of cable, as long as the actual measuring range is 690 feet or less. Both units can be calibrated to any measuring range needed, up to 690 feet. The 575 and 575P submersible level transmitters have a 316 Stainless Steel housing. The Model 575 comes with a standard nylon snub nose and 316 Stainless Steel diaphragm. The Model 575P has a protective cage and Hastelloy C diaphragm for agitated liquid in sewage and industrial applications. Cable options include Teflon or polyurethane, and optional potting is available. 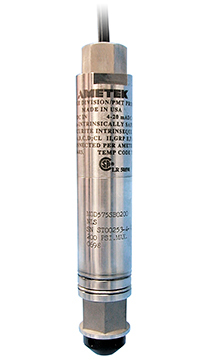 The 575 and 575P submersible level transmitters are manufactured in the USA.